As I think about the sermon from Sunday, I can’t help but wonder if Mary had any idea what beautiful and redeeming things God was going to do out of her humble (and even terrifying) circumstances. Take a look at your life. Is it possible that God might be doing beautiful and redeeming things, eternal in nature, in the midst of your present circumstances? Even if they seem to be humble (simple, modest) or terrifying in nature? The stage was set. “Britain’s Got Talent” was ready to follow in the tradition of American Idol and serve up harsh criticism to those who “thought” they had talent. Enter Susan Boyle. Her odd walk, unkept hair and age primed the crowd for laughter. Cameras panned through the audience to locate those already chuckling. The giggles turned into loud laughter when Susan shared that her dream was to be a very famous singer. Then she sang. Beauty showed up. Applause surprisingly sprouted from the cruel crowd. Everyone turned from stunned to belief. So why did this scene become a Youtube sensation with 12 million views? Because we believe that there is a shortage of Beauty and Talent in the world. What Beauty and Talent does exist, we believe is harnessed in a very limited part of the population, who look a certain way and are of a certain age. And when Susan Boyle hit that high note, people cried because they realized that they were wrong. There was more Beauty in this world than they had originally thought. And to think, that Susan Boyle came from the humble beginnings of Blackburn, Scotland a tiny town that can be walked in 5 minutes. Mary also grew up in a small town, called Nazareth. A town of around 100 people when little old Mary heard from the angel that she would give birth to the Messiah. People would have looked at Mary and Nazareth the same way as they looked at Susan Boyle. The answer is a resounding YES. Yes, this world is so filled with Beauty that you can even find Beauty in places like Nazareth …and Blackburn, Scotland. The story of Mary teaches us to not judge a person based upon hometown and status. It also teaches us to look closely, withhold judgement….. Because there is more Beauty in this world than we had originally thought. And our mistake in thinking otherwise, is corrected by God this Christmas. How can you prepare your heart to find Beauty in the unexpected places like Blackburn and Nazareth? Steven Blair serves as Pastor of Congregational Care (Last Names M- R) at The United Methodist Church of the Resurrection. No one likes war. It reminds us of conflict, pain, suffering, loss and especially death. Most of us want to avoid war at all costs. But our Scripture passage for today reminds us that we are all engaged in a war–not necessarily a physical battle, but a spiritual one. And we are in this war every day. How do we live our daily lives with the burden of this reality? The good news is that we have help. As I read this passage, I am reminded that I don’t have to fight in my own strength. If that were the case, I would have no hope. But God has given us weapons and HIS power through which we can fight. My job is to engage with Christ through prayer and reading His Word, so that I can endure my battles. This is more challenging though than it sounds. My wars sometimes feel like a sneak attack and come in a subtle way when I’m not paying attention. It may be things like a critical spirit, a prideful heart, feelings of inadequacy, financial despair, or attachments to things that are not good for me. Paul was in prison while writing this letter, yet his prayer request was not that he would be released. Instead, he asks that God would give him the right words to say as he shared the Gospel with those around him. He asks that he would be brave and that he would be a good ambassador of the Gospel. I love the term “ambassador” that he used here. It reminds me that as ambassadors we represent a different Kingdom than the one that we are currently living in. What good news! Paul tells us to “pray at all times in the Spirit”. What that means to me is that through prayer, I unite my heart, mind and spirit with that of Christ. That it is only through Him, I can conquer the things that threaten to overpower or take me away from Him. Not to necessarily take me out of the difficult or challenging situations I face, but to give me the strength to endure them. We face war everyday in this world, but by uniting our hearts with Christ, “praying at all times”, and through His power, we can be victorious. Michelle Kirby serves as Learning Events Program Director at The United Methodist Church of the Resurrection. This entry was posted in Uncategorized on November 27, 2010 by admin. Paul is doing a little reminiscing in today’s passage. He is in prison in Rome. He begins to think of those near & dear to him from his time in Philippi. To be blunt, it is a little hard for us to join in Paul’s revelry. We know that while in Philippi, Paul was illegally arrested, beaten, & placed in stocks. Who could view this as a fond memory? Yet, Paul recalls this scene & rejoices in the jailer who was saved for Christ. This Thanksgiving weekend is a time for us to do a little reminiscing as well. We might recall wonderful celebrations where we sat at the card table with the wobbly leg. Perhaps we remember when an extra chair (or high chair) was set at the table to welcome a new addition to our family. Maybe we retain the memory of the spot at the table usually reserved for a loved one, who is no longer with us. Yet, we also acknowledge that Thanksgiving can be a time of stress for families. Instead of having family members on our hearts (as Paul suggests), we might have these relatives on our nerves. As Groucho Marx noted, “It is wonderful to have a loving, close-knit family living in Kansas City.” (I don’t get it – Editor.) Groucho was living in L.A. at the time. Vegetable: I pray for you constantly with a glad heart. Now, that would be a feast to remember. Happy Thanksgiving! This is a day that we intentionally stop to be thankful for the blessing in our lives – family, friends, jobs, and important material things that matter to us such as food, beds to sleep in and a house to live in. It is also a day to start something new in your routine. It is one thing to remember to be thankful on a day set aside to be thankful, but another to be thankful during the tough times (and, sometimes even harder, to remember during the good times). Anxiety and stress fill many people’s lives. According to the National Institute of Mental Health an estimated “18.1 percent of people” ages 18 and older or “approximately 40 million American adults” struggle with an anxiety disorder (www.nimh.nih.gov). In the current economic environment, I am sure that this is growing as there are many things for people to worry about – jobs, homes, food on the table, caring for children, paying the bills and so much more. Paul gives us clues to help us with our struggles with anxiety in Philippians 4:4-7. “Rejoice in the Lord always. I will say it again: Rejoice! Let your gentleness be evident to all. The Lord is near. Do not be anxious about anything but in every situation by prayer and petition, with thanksgiving, present your requests to God. And the peace of God, which transcends all understanding, will guard your hearts and your minds in Christ Jesus.” I would not say that “not being anxious” and “giving things to God” make dealing with anxiety issues easy. Many times when I pray for help with stresses and worries in my life, after I give them to God I take them back again. What is important is to remember that God is always with us to bear the burden of our worries, to try every time to give it to God. It probably looks like the game “Chutes and Ladders.” You give things to God, are doing okay, may make some progress – like climbing a ladder – and then you hit a rough patch and slide down the slide. Thanksgiving marks the beginning of the Christmas season, as Thanksgiving Day parades end with Santa Claus coming to town and the stores prepare to open in the early morning hours of the next day. Although Christmas should be a time of “peace and good will toward men” for many of us (including me), it can be one of the most stressful times of the year. It’s so easy to forget to take this day of thankfulness with us into the Christmas season, and beyond into the New Year. But “the peace that passes understanding” seems worth the effort. As you spend your day being thankful, ask God to remind you, and help you, to give the worries and stresses that come up into God’s hands more and more each day. Then make this prayer, and a prayer of thanksgiving, a prayer you say every day. 26 In the same way, the Spirit helps us in our weakness. We do not know what we ought to pray for, but the Spirit himself intercedes for us through wordless groans (or sighs). 27 And he who searches our hearts knows the mind of the Spirit, because the Spirit intercedes for God’s people in accordance with the will of God. I do not have to come up with all of the words and make them perfect before I offer them to God. Instead, God meets me where I am. The Spirit of God helps me pray to God. I can use verbal or nonverbal communication. The nonverbal communication with God is what I rest in. Whenever I think prayer may be too hard or I don’t have time for it, I reflect on the nonverbal communication, especially this verse….the sighs and the groans that are too deep for words. In the high points of life and in the low points of life, I find that words fail me. Sometimes a sigh can say it all. On Monday night, my small group read these verses aloud and found comfort in them too. We joked about all of the “sigh prayers” we can do as we prepare for Thanksgiving. The moments of preparation can be full of sighs; the appreciation of friends and family can be full of joyful sighs. Life and new experiences can be full of great sighs and the loss of a loved one can be full of deep, hard sighs. There are moments when we are at a loss for words – in these moments God fills in for us as we pause and acknowledge God’s presence. This is a way of praying. In this season of Thanksgiving, I am grateful for the Spirit of God helping us pray to God. We don’t have to come up with all the words and we don’t need to know what we need. Today – just pause, sigh or even groan in prayer- as you experience joys and challenges today. This past Sunday we closed our six-week sermon series on prayer by talking the lessons we learn from the Apostle Paul. One word summarized the majority of Paul’s teaching on the subject matter, and that word is “Thanksgiving.” Paul writes, “Rejoice always, pray without ceasing, give thanks in all circumstances; for this is the will of God in Christ Jesus for you.” This is our task, to give thanks in all circumstances, to count blessings, and to offer gratitude in all circumstances. This can be difficult to do. However, this is something that I have experienced first hand in the past 24 hours. I pray that people will meet God in worship, and that through prayer, music, scripture, sermon and/or communion they might have an encounter with the Living God. The bottom line is that I want people to experience God in worship. I want them to know the breadth and length and height and depth of God. I want people to know the love of God that surpasses knowledge. This past Sunday night things started off a bit differently than they normally do. This past Sunday we experienced just our second CART (Cardiac Arrest Response Team) emergency in our short life as a campus. One of our parishioners was rushed away by ambulance to the hospital just minutes before the service. When she fell, we cared for her immediately and prayed for her fervently. After she was on her way to the hospital we sent a pastor and another couple to accompany her husband to the hospital just to be there for them. Then we started worship. I opened the worship service the way we usually do. I said, “Our prayer is that everyone in attendance would meet God here in this place tonight.” The service was moving, the sermon was stirring, the sacrament filled us with a love that surpasses knowledge. However, I can’t say that I encountered the full breadth and length and height and depth (the fullness of God) until I arrived at the hospital later that same night in the minutes that followed worship. May you experience the love of God in unexpected places today! The scripture text from the GPS today is an amazing story of conversion. This story is pivotal in the life of the church as Paul became one of the greatest evangelists (An evangelist is someone who shares good news, in this case, the good news of Jesus Christ.) of the church. In addition, the correspondence that Paul wrote to believers in cities across the Near East became a majority of the New Testament. I am encouraged by hearing stories of lives that have been changed by God’s work. My father is a United Methodist pastor and I grew up going to church. I did not have a negative reaction to the church, it was just part of what we did as a family. I learned the stories of scripture, received my third grade Bible and went through confirmation as a teenager. One of the markers in my spiritual journey was in high school. I was spending time reading the Bible, praying and considering Christ’s work on the cross. I had always believed that the forgiveness that is made possible for Jesus life, death and resurrection was true for the whole world. What I realized on that afternoon was that this was true for the whole world, and also for me. God’s love and forgiveness was for me. The me that is a bit of a mess at times. The me that messes up my relationships with God and other people. The me that sometimes trusts my intellect and resources without recognizing that these are all gifts from God. This was a powerful realization for me and I remember feeling connected with God in a way that I had not previously experienced. There continue to be markers in my spiritual journey of becoming a deeply committed Christian. Where have you seen God at work in your life? This entry was posted in Uncategorized and tagged Bible, Christ, Christian, God, Jesus, Jesus Christ, Near East, New Testament on November 22, 2010 by admin. Lazarus’ resurrection from death is a story familiar to us, and has even been included in many movies and book references. I still remember a movie I watched as a kid when they rolled back the tombstone and everyone in the movie scene covered their noses. (Don’t we remember the oddest things?) But seriously, why have we focused so intently on this episode in Jesus’ earthly walk? Perhaps first, because we are amazed by the miracle itself and the power of Jesus’ love for his friend, and secondly for the grand and clear statement it makes that God is omnipotent and hears our prayers. As the story unfolds, Martha confirms to Jesus that she has faith that her brother will live, eventually. “I know he will rise again in the resurrection at the last day.” But Jesus makes it a point to tell Martha “I am the resurrection and the life. The one who believes in me will live, even though they die; and whoever lives by believing in me will never die.” He is giving Martha a peek at both future and current truth. 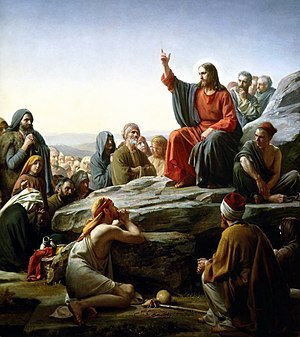 Jesus acknowledges and thanks God the Father for always hearing his prayer and then the miracle takes place. Lazarus walks out of his tomb. Every bit of the story is an amazing picture of the power of God’s love, but what strikes me most today about the story is the last nine words. Jesus gives the directive, “Take off the grave clothes and let him go.” To me, this is a statement that Jesus, through His death and resurrection, has taken the grave clothes off of each of us by paying for our sins, and is ‘letting us go’ to pursue a relationship with Him in free will. Thank you, Father God, for the gift of your Son Jesus, and for our daily walk with Him. Thank you, Resurrection, for being a community that is in prayer. Join your Resurrection community at the Thankful day of Prayer on Nov. 23! Listen to this song about prayer: ‘before the morning’ by Josh Wilson. Mary Jones serves as Connections Ministry Program Director at The United Methodist Church of the Resurrection. This entry was posted in Uncategorized on November 20, 2010 by admin. At times reading the Bible is like hiking familiar trails in Colorado. You can cover the same ground on multiple occasions; yet still find something new that stands out to you. Today’s reading is both well known & inspiring. Our friend, the Centurion, was a man of great power, yet humble. He displayed incredible compassion for his slave, generously built the Jewish synagogue, & showed great respect for the customs & traditions of the Jewish faith. By any measure, he was a very impressive man. But today’s reading also offers us a startling phrase. “He (Jesus) was amazed at him…” Whoa. A quick double-check confirms that this phrase has always been there, but had just been overlooked in previous readings. As I pondered this verse, I wondered if it would be possible for us to amaze Jesus by our faith today? He might possibly be taken aback by a friend’s suggestion for my men’s group to consider setting up an account to set aside money to buy a water well for a village in Africa. Maybe He is astonished at friend of mine who, while jogging, sees a homeless man on the corner. After returning home, my friend gets in the car, picks up the homeless man, buys him a meal at Denny’s & confirms a room for him that evening at the Red Roof Inn. It’s funny. We don’t know the Centurion’s name or much about his background. In our culture, we seem to celebrate those who are known by thousands of fans or who have a long list of followers on Twitter. Our Centurion wasn’t known by thousands, just One. Perhaps we should prayerfully seek the same level of popularity this day. This entry was posted in Uncategorized on November 19, 2010 by admin.